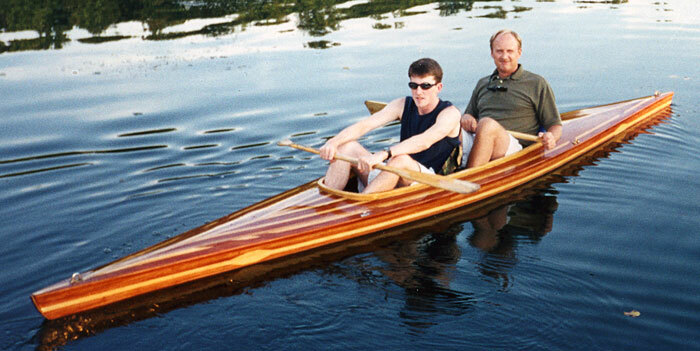 Rick Culliton and his son, Tom, in a 16' kayak designed by Rick for use in the lakes and rivers near his home in Germantown, MD. According to Rick, it's really designed for use by one man, or one man and a dog, but they were both able to squeeze in for this photo taken on Black Hills Lake in Boyds, MD. The boat is named KJEN7, after his wife Katie, daughter Jennifer, and 7 for the 7th boat he has built. In designing her, he built her low to stay out of the wind, narrow and long for speed. He built her out of mahogany, because "he just had to." Rick's wife Katie may be contacted at 6015 Henning Street, Bethesda, MD 20817.